← How to print html to bitmap image? 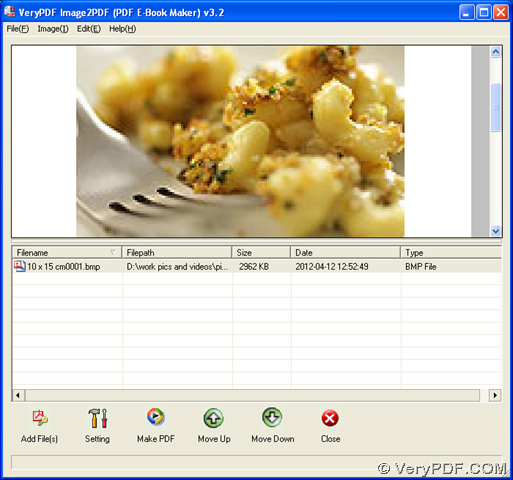 If you want to convert BMP to PDF, I think application of Image to PDF Converter can help you with that in Windows systems. You can fulfill this process with 2 different ways in form. Please download installer of GUI version of Image to PDF Converter0 on your computer, then double click this installer and follow setup wizard step by step till it is successful to install Image to PDF Converter on your computer. Then, open GUI interface like below, and click button of “Add Files” there, so you can select BMP file in dialog box of “Image2PDF”, after that, please click “Open” there, so this BMP file can be added for this process, which can display as a path in processing form. Then, you can click button of “Make PDF” > click one of options on dropdown list > select a destination folder in dialog box of “Save As”, then click “Save” there, finally, Image to PDF Converter can help you produce PDF from BMP file. 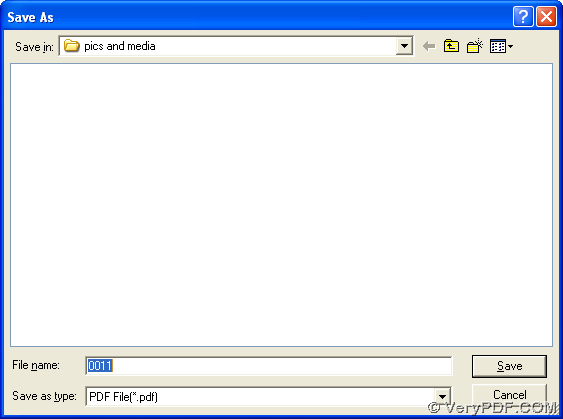 Please download zip file of command line version of Image to PDF Converter on your computer. Then, open it > extract its content to your computer so that program “img2pdf.exe” can be called later. 1. Please click “Start” > select “Run” on start menu > type “cmd.exe” in dialog box of “Run” > click “Ok”, then command prompt window can be popped on your screen, which is running environment mentioned above. D:\image2pdf_cmd3.2\img2pdf.exe is the path of “img2pdf.exe”, which is used to call this program directly in order to use it later; –o is the parameter to produce PDF file, which must be typed before targeting path; F:\output\example2.pdf is the targeting path used for saving PDF file on your computer, which must be typed after the parameter “-o”; G:\input\example2.bmp is the source path used to add this BMP file for this process. After those commands are finished like above, one click on “enter” can help you produce PDF from BMP with command line of Image to PDF Converter. So far, please leave your comments here, in case you have questions on this process, which is from BMP to PDF. 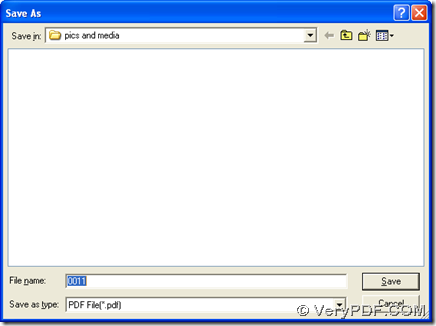 And for more knowledge of Image to PDF Converter, it is convenient for you to visit homepage of Image to PDF Converter. Can I convert image file to PDF using the same file name by Image2PDF? Who can help me convert this PCX to PDF file by command line? This entry was posted in Image to PDF Converter and tagged bmp to pdf, command line. Bookmark the permalink.